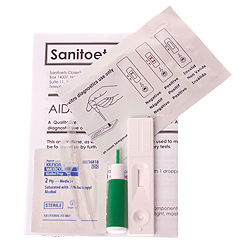 Our HIV test kit is an initial assay device which can be used in the privacy of your home. Our economical Aids test kit is used with great success as a primary screening test to ascertain your Aids/HIV status at home. It is an immunochromatographic test for detecting antibodies to HIV 1 and 2 in "whole blood" (finger prick with supplied Medlance). PLEASE NOTE: Our test kit has NOT been evaluated or approved by the USA FDA and is not registered in America. For that reason it is ONLY SOLD in SOUTH AFRICA. When properly used, and testing procedure is followed the results are accurate - but still, like any test, will depend on the concentration of HIV antibodies in your blood, as a too low concentration will not show on any test. This assay alone, as with any rapid assay cannot be used to make a final diagnosis of AIDS, and any positive results should be followed up by further tests, including laboratory tests. One of the main benefits with a home test kit is the fact that the results are available immediately and no waiting is required for laboratory tests to come back. Please note: these tests are supplied as initial screening tests, and any positive result should be followed up with a laboratory test which is done in clinical circumstances. Another plus factor is the cost involved, as the kits are affordable and then another point is the privacy when doing these tests. Some people, for various reasons, would like to perform these tests privately, and although we do advise clients to follow up any result of a home test with a laboratory test, we do however respect the individual person's right to perform a test in private as well. Available data indicates that the acquired immunodeficiency syndrome (AIDS) and AIDS related complex (ARC) are caused by the human immunodeficiency virus type 1 and type 2 (HIV-l and HIV-2). For more information on the transmission of the virus, please click here. The HIV Rapid test is intended as an initial qualitative screening test to detect HIV-1 and 2 antibodies in whole blood within 5 minutes. This test should be used as a screening test and as an aid to diagnosing antibodies to HIV-l and 2. Any positive results should be followed up by further tests, including laboratory tests. Stored at room temperature the test kit components are stable until expiry date printed on label. The test kit should be kept from direct sunlight, moisture and heat. Do not freeze the test kit. This assay alone, as with any rapid test cannot be used to make a final diagnosis of AIDS. It takes up to 12 weeks after the initial infection for any AIDS test to be able to detect the presence of HIV antibodies. A test done too soon after the infection will not pick up any antibodies and will give a negative test result. The test should be repeated at about 12 weeks after the suspected infection date. If a patient has engaged in any risky sexual activity during the 12 week window period, a further test should be done 3 months after the event took place. Treat all blood specimens as hazardous material and it is recommended to wear protective gloves (not supplied) when performing this test. Dispose of any blood specimens immediately after completion of the test in the prescribed manner. Do not remove a cassette from its pouch until you are ready to do the test. When doing the test, the whole blood specimen must be transferred into the cassette sample collection "well" as quickly as possible so avoid homeostasis in the pipette. Ensure that the test kit is at room temperature before starting the test. Remove the cassette from its pouch, and place it on a flat surface. Cleanse the end of a finger with the enclosed sterile swab and dry it with a sterile pad or tissue. Squeeze the top end of the empty pipette to form a vacuum. Apply the mouth of the empty pipette to the blood on your finger, while releasing the top of the pipette to draw the blood into the stem of pipette. Avoid drawing air bubbles into the pipette. Holding the pipette in a vertical position, immediately dispense ONE free-falling (1) drop of the blood into the center of the cassette’s round sample well. Cut the end of the sealed pipette that contains the reagent and add THREE (3) drops of the reagent into the sample well. Results are read in as little as 5 minutes for strong positives, or up to 20 minutes for weaker positives and to make sure that negatives are confirmed. Note: if the dye has not moved across the test window after 2 minutes, add one of two drops of the reagent to the sample well. DO NOT READ THE RESULTS AFTER 20 MINUTES, AS THE RESULTS MAY BE INVALID. Twist off the long green protective lancet cap and pull it out. Hold the finger pricker against the fingertip and press the back of the finger pricker device to release the needle. Gently massage the finger towards the puncture site to obtain the required volume of blood. Turn the hand so that the blood drop hangs from the fingertip. Both the C line (control) and the T line (test line) are visible indicating the presence of HIV antibodies in the specimen. When the level of antibodies to HIV is very low, the T line might present as a pink shadow and should be considered as a possible weak positive result. A positive result by itself does not necessarily mean that the tested individual has AIDS. It means that in the judgment of the person performing the test that the serum or whole blood specimen is reactive. Rapid non-laboratory AIDS tests are designed to provide a low cost and convenient alternative to laboratory testing to assist more individuals in determining their HIV status. Only one line, the C line, is visible indicating that no antibodies to HIV were detected in the specimen and the test result seem to be negative. This AIDS negative interpretation indicates the absence of HIV antibodies, or that the concentration of HIV antibodies is below the detection limit of the test. The negative result by itself does not necessarily mean that the tested individual does not have AIDS. A HIV infected person may have an incubation period of between 10 days and 3 months from date of infection before a detectable level of antibodies is produced. It is recommended that a second AIDS test should be done after 3 to 6 months.